Welcome to CSF! We are glad you are here. This is a time and place where all are welcome – from lifelong Christians to skeptics to those searching for something they can’t quite explain. During our weekly meeting we will do some things you might find in church: we may sing some songs of worship to God, we will read the Bible, a pastor or guest will comment on the Bible and we will pray for each other. Beyond our Thursday meetings we also have lots of other activities which you can read about on the site. At CSF meetings, know that all opinions are welcome. Friendly disagreement and dialogue is one way we grow. Even those of us who call ourselves Christian do not agree on everything! But we do agree that life and hope are found in Jesus Christ. Who are we? (Longer Version) - We are students who believe that God is revealed to humanity ultimately in Jesus Christ who is fully God and fully human. We seek to know Jesus Christ as savior, teacher and lord and to make known the love of Christ to others. We believe the teaching of Jesus is summed up in the command to love God and to love your neighbor, so we desire to promote love of God and love of each other on campus. All people are welcome at any of our meetings and events! 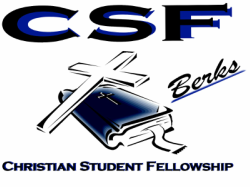 Membership in CSF shall be open to those who wish to be part of a community focused on Jesus Christ. Our weekly meetings are very informal and any person is welcome. All opinions are valued and respected. As a Christian organization, we adhere to historic Christian orthodoxy as laid down most clearly in the early church ecumenical councils. Thus, we favor no branch of Christianity but instead seek unity on what Christians from diverse backgrounds agree on. We believe each human being is created in God’s image and thus has value, so we do not discriminate against any gender, race, ethnicity, religion, physical handicap, socioeconomic status or sexual orientation. Along with that, we believe each human being is broken (sinful) and in need of God's grace and love.